Work to re-surface courts 6 & 7 and to install LED floodlights has now been completed. This is fantastic news for the club, increasing the court time available to us and reducing the impact of bad weather on our playing time. This has been a massive effort over the past year and huge thanks to all involved. We appreciate that there appears to be quite a lot of sand on the courts at the moment. We have been in touch once more with the contractors and this is quite normal and established practice. With frequent play and dry/wet weather cycles this should settle over the next few weeks. We will then get the contractors back to review and adjust if necessary. As is the case with courts 4 & 5, please do remember to drag the surface after you play. 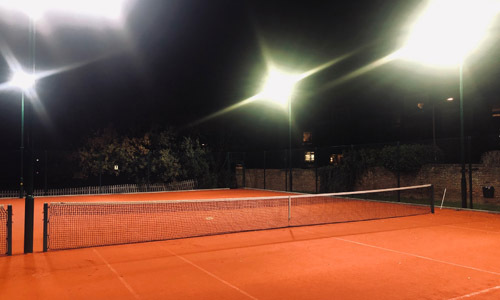 One important point to note is that the planning permission we have for the floodlights on courts 6 and 7 stipulates that we can use them until 9pm between Monday and Saturday, and not at all on Sundays. It is very important that we abide by these restrictions. Lights on courts 1-5 may now be used every day. Unfortunately, more work is required to Court 3. It was immediately apparent that the new surface was cutting up and we agreed with the contractors that it would be re-laid after the completion of courts 6/7 (to avoid too many courts out of action at one time). This has now been completed and after another week to cure it will be painted with temporary lines to be playable once more. The court will be painted (green/red) in the Spring as that requires a stretch of dry weather. We will also have re-turfed the grass areas that have been damaged by all the court works. This system is based on trust and will be revoked if it is abused. In order for the club to keep track of payments, please record all purchases in the book that can be found near to the honesty box. Simon Godfrey has very kindly donated a ball machine for members to hire at just £5 per hour. A payment box and instructions can be found in the kitchen, while the machine and a bucket of balls are stored in the small shed on Court 1. Please be considerate of other members when using the machine and return the machine and balls to the shed after use. Old College has three categories of tennis membership – ‘improver’, ‘intermediate’ and ‘advanced’, which are intended to provide members with the opportunity to play at a level that is comparable to their ability. However, we have no objective standards to measure these categories against at present, meaning that the system lacks transparency and may be interpreted inconsistently. As a simple way of remedying this situation, the coaching team are in the process of finalising a set of guidelines to use when ‘playing-in’ potential new members and in order to help make decisions about moving existing members to a higher category. Full details will be shared in due course. As well as improve the transparency around decision making, it is hoped that the new guidelines will give members in the improver and intermediate categories more of concrete a goal to aim for when seeking to develop their game. Please note that it will not be possible for members to be moved to a lower category and it will not affect the categorisation of existing members in any way. A reminder that the winter box league is up and running with matches being played with the new scoring format. Please do try and complete your matches in the allotted time, and remember to enter your scores on the website. Any queries go to Hamid Irshad. Chris Barker, ran a Leaders’ Course in October to train 11 children to help the coaches with Mini Tennis sessions. The Junior Santa Tournament date is proposed for Wednesday 19th December from 4pm. More details to follow. After a review of our management Matt Cowie will be taking on additional responsibility for junior competition. This will involve co-ordinating all junior teams, managing the junior club championships and organising other internal junior tournaments and events. With thanks to Matt Cowie, we now have a new and improved website. Unnecessary content has been trimmed back and it is now much simpler to navigate. A member’s area can be accessed using the same PIN that you use to book courts and this includes details about club policies, committee decisions and teams. Please take a moment to have a look if you haven’t done so already. At this time of year the needs of people who are not so fortunate as ourselves are particularly stark. You will see in the clubhouse a box for donations to our local Norwood and Brixton foodbank (https://norwoodbrixton.foodbank.org.uk). Please do give generously if you can, particularly the following items: tinned meat pies, tinned corned beef, UHT milk, long-life fruit juice or squash, tinned custard, tinned rice pudding, instant coffee, cereals, tinned tomatoes, sponge puddings, biscuits, shower gel, shampoo, deodorant, toilet roll (not pasta, baked beans or tea). Two of our longstanding members, Rachel Garforth-Bles and Jean Sutton, are supporters of the foodbank and will ensure that our donations reach those in need. We end with a plea. Running our club is achieved through the enormous efforts of a large number of members who give up their time to help, almost always on top of their day job. Some of this work is very evident – for example our new courts – but most happens behind the scenes. There is so much to do that we continually need more volunteers – either to take on particular tasks or to take over from committee members who are coming to the end of their terms of office. So, if you do have some time to spare and are willing to give something back to the club please contact the Members’ Rep (Aruna Iyengar) or another committee member. Details can be found here. Finally, we are also always keen to hear feedback, new ideas and thoughts about how to improve life at the club – both on and off court. So, if you do have any suggestions, please let us know!